3200 B.C.E. – 400 C.E. Egyptian hieroglyphs are a formal writing system used by the ancient Egyptians, and are perhaps the most widely recognized form of hieroglyphic writing in the world. The term "hieroglyph" originally referred only to Egyptian hieroglyphs, but has now been expanded to include other hieroglyphic scripts, such as Cretan, Luwian, Mayan, and Mi'kmaq. The Egyptians used hieroglyphs mainly for formal, religious inscriptions (hence their name, "the god’s words"). Egyptian glyphs, like those of many other hieroglyphic scripts, often consist of recognizable objects such as the sun or a bird, and incorporate a combination of logographic and phonetic elements. Egyptian hieroglyphs constitute one of the oldest known writing systems in the world. Developed from pictures that symbolized well known objects, they allowed those in authority to document religious teachings as well as edicts from the pharoah. In this form the hieroglyphs were generally inscribed in permanent materials such as stone, and thus numerous examples of stelae and inscriptions on tombs have been discovered by archaeologists while excavating sites of importance to the ancient Egyptian culture. Contemporaneously, the hieratic script was developed to allow easier writing using ink on papyrus and later the demotic script was developed for secular use. It is through the use of this script that Egyptian hieroglyphs could be deciphered, as the Rosetta stone contains inscriptions of the same text in these scripts and Greek. Thus, it is now possible to know much about ancient Egyptian culture from thousands of years past through their hieroglyphic writing. Given the significance of this culture in human history, such understanding is of great value. A section of the Papyrus of Ani showing cursive hieroglyphs. 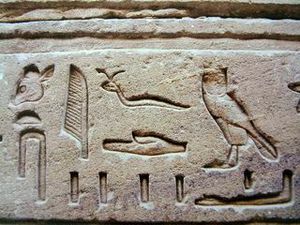 The word "hieroglyph" derives from the Greek words ἱερός (hierós): "Sacred" and γλύφειν (glúphein): "To carve" or "to write," as in the term "glyph." This was translated from the Egyptian phrase "the god’s words," a phrase derived from the Egyptian practice of using hieroglyphic writing predominantly for religious or sacred purposes. The term "hieroglyphics," used as a noun, was once common but now denotes more informal usage. In academic circles, the term "hieroglyphs" has replaced "hieroglyphic" to refer to both the language as a whole and the individual characters that compose it. "Hieroglyphic" is still used as an adjective (as in a hieroglyphic writing system). Reverse and Obverse Sides of Narmer Palette, this facsimile on display at the Royal Ontario Museum, in Toronto, Canada. The origin of Egyptian hieroglyphs is uncertain, although it is clear that they constitute one of the oldest known writing systems in the world. Egyptian hieroglyphs may pre-date Sumerian cuneiform writing, making them the oldest known writing system; or the two writing systems may have evolved simultaneously. One of the oldest and most famous examples of Egyptian hieroglyphs can be found on the Narmer Palette, a shield shaped palette that dates to around 3200 B.C.E. 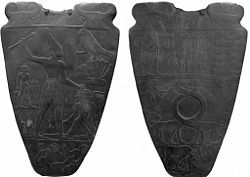 The Narmer Palette has been described as "the first historical document in the world." The palette was discovered in 1898 by archaeologists James E. Quibell and Frederick W. Green in the ancient city of Nekhen (currently Hierakonpolis), believed to be the Pre-Dynastic capital of Upper Egypt. The palette is believed to be a gift offering from King Narmer to the god Amun. Narmer’s name is written in glyphs at the top on both the front and back of the palette. Hieroglyphs on an Egyptian funerary stela. The Egyptians used hieroglyphs mainly for formal, religious inscriptions (hence their name, "the god’s words"). Hieratic, or "priestly" script developed alongside hieroglyphs and was used extensively on religious degrees, manuscripts, and paintings. Hieratic script is essentially a simplified form of hieroglyphic writing that was much easier to write using ink and papyrus. Around 600 B.C.E., the demotic script replaced hieratic for everyday use. Though similar in form to hieratic script, the highly cursive demotic script has significant differences, and there is no longer the one-to-one correspondence with hieroglyphic signs that exists in the hieratic script. Demotic script did not replace hieroglyphic script, but rather existed alongside it; the priests continuing to use hieratic for religious writings while demotic was used for secular purposes. Hieroglyphs continued to be after the Persian invasion, as well as during the Macedonian and Ptolemaic periods. The Greeks used their own alphabet for writing the Egyptian language, adding several glyphs from the demotic script for sounds not present in Greek; the result being the Coptic alphabet. 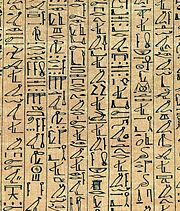 Although the Egyptians were taught the Greek language and its alphabet under the rule of the Ptolemys, they did not abandon their hieroglyphic writing. It was not until the Roman invasion of 30 B.C.E. that use of hieroglyphs started to dramatically decrease: Roman rule was harsh, and the Egyptian people were subjected to heavy taxes and less autonomy than other Roman provinces. The final blow to hieroglyphs came in 391 C.E., when Emperor Theodosius I declared Christianity the only legitimate imperial religion, and ordered the closing of all pagan temples. By this time, hieroglyphs were used only in temples and on monumental architecture. The last known hieroglyphic inscription, carved on the gate of Hadrian at Philae, is dated to 394 C.E. Hieroglyphs survive today in two forms: Directly, through the half dozen demotic glyphs added to the Greek alphabet when writing Coptic; and indirectly, as the inspiration for the Proto-Sinaitic script, discovered in Palestine and Sinai by William Flinders Petrie and dated to 1500 B.C.E. In Canaan this developed into the Proto-Canaanite alphabet, believed to be ancestral to nearly all modern alphabets, having evolved into the Phoenician, Hebrew, and Greek alphabets. Those who conquered Egypt during the time when hieroglyphs and hieratic script were in common use did not learn them. Thus, although the Greeks developed the Coptic alphabet for writing the Egyptian language, they included only a few demotic glyphs. When the Egyptian religion, which was the last use of hieroglyphs, was replaced with Christianity, all knowledge of hieroglyphs was lost and they came to be regarded as mysterious, symbolic representations of sacred knowledge, even by those contemporary with Egyptians who still understood them. Almost from its inception, the study of Egyptology was dominated by a Euro-centric view, and it was a widely accepted fact that French Egyptologist Jean Francois Champollion was the first to decipher hieroglyphic writing. However, work by Egyptologist Okasha El Daly uncovered a vast corpus of medieval Arabic writing that reveals that to Arabic scholars, such as Ibn Wahshiyya, in the ninth and tenth centuries, hieroglyphs were not just symbolic but could represent sounds as well as ideas. In part, these manuscripts were scattered amongst private and public collections, and were either uncataloged or misclassified. Since Egyptologists erroneously believed Arabs did not study Egyptian culture, the significance of these manuscripts to Egyptology was overlooked for centuries. In early Western attempts to decipher hieroglyphs there was a prevailing belief in the symbolic, rather than phonetic nature of hieroglyphic writing. Works like Horapollo’s Hieroglyphica, likely written during the fifth century, contained authoritative yet largely false explanations of a vast number of glyphs. Horapollo claimed to have interviewed one of the last remaining writers of hieroglyphs, and stated that each symbol represented an abstract concept, transcending language to record thoughts directly. This, of course, was untrue, but it set the stage for a widespread belief that the glyphs represented secret wisdom and knowledge. Imaginative books like Nicolas Caussin’s De Symbolica Aegyptiorum Sapientia (The Symbolic Wisdom of Egypt) (1618) further pushed the translation of the glyphs into the realm of the imagination. While Ancient Egyptian culture fascinated Western scholars, the meaning of hieroglyphs remained an elusive mystery. For nearly fourteen hundred years, Western scholars were not even sure that hieroglyphs were a true writing system. If the glyphs were symbolic in nature, they might not represent actual, spoken language. Various scholars attempted to decipher the glyphs over the centuries, notably Johannes Goropius Becanus in the sixteenth century and Athanasius Kircher in the seventeenth; but all such attempts met with failure. The real breakthrough in decipherment began with the discovery of the Rosetta Stone by Napoleon's troops in 1799. 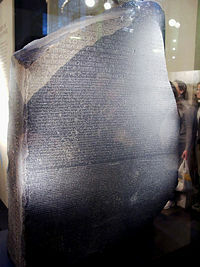 The Rosetta Stone contained three translations of the same text: One in Greek, one in demotic, and one in hieroglyphs. Not only were hieroglyphs a true writing system, but scholars now had a translation of the hieroglyphic text in an understood language: Greek. The Rosetta Stone was discovered in the Egyptian city of Rosetta (present-day Rashid) in 1799, during Napoleon’s campaign in Egypt. While the French initially had possession of the stone, it eventually made its way into the hands of the English. Two scholars in particular worked to decipher the Stone’s mysteries: Thomas Young of Great Britain, and French Egyptologist Jean Francois Champollion. In 1814, Young was the first to show that some of the glyphs on the stone wrote the sounds of a royal name, Ptolemy. Champollion, who is generally credited with the translation of the hieroglyphic text of the Rosetta Stone, was then able to determine the phonetic nature of hieroglyphs and fully decipher the text by the 1820s. Visually, hieroglyphs are all more or less figurative: They represent real or illusional elements, sometimes stylized and simplified, and generally recognizable in form. However, the same sign can, according to context, be interpreted in diverse ways: as a phonogram, as a logogram, or as an ideogram. Additionally, signs can be used as determinatives, where they serve to clarify the meaning of a certain word. Hieroglyphs are most commonly written from right to left, but can also be written left to right, or top to bottom. The direction the glyphs should be read is indicated by the direction faced by asymmetrical glyphs. When human and animal glyphs face to the right, the text should be read from right to left. Conversely, when the glyphs face left, the text should be read left to right. Like other ancient writing systems, words are not separated by blanks or by punctuation marks. However, certain glyphs tend to commonly appear at the end of words, making it possible to readily distinguish where one word stops and another begins. Most hieroglyphic signs are phonetic in nature, where the meaning of the sign is read independent of its visual characteristics, much like the letters of modern alphabets. Egyptian hieroglyphics did not incorporate vowels, and a single glyph can be either uniconsonantal, biconsonantal, or triconsonantal (representing one, two, or three consonants respectively). There are twenty-four uniconsonantal (or uniliteral) signs, which make up what is often called the “hieroglyphic alphabet.” It would have been possible to write all Egyptian words with just the uniconsonantal glyphs, but the Egyptians never did so and never simplified their complex writing into a true alphabet. These type of determinatives, or phonetic complements, are generally placed after a word, but occasionally precede or frame the word on both sides. Ancient Egyptian scribes placed a great deal of importance on the aesthetic qualities as well as the meaning of the writing, and would sometimes add additional phonetic complements to take up space or make the writing more artistic. Determinatives also serve to distinguish homophones from one another, as well as glyphs that have more than one meaning. In addition to a phonetic interpretation, most hieroglyphs can also be used as logograms, where a single sign stands for the word. Logograms are accompanied by a silent vertical stroke that indicates the glyph should be read as a logogram. Logograms can also be accompanied by phonetic complements that clarify their meaning. Other examples can be more indirect. The logogram dšr, means "flamingo:"
The glyphs in this cartouche are transliterated as: pt+o+lm+ii+s, where “ii” is translated as “y,” spelling out the name of the ruler Ptolemy. This cartouche was significant in the decipherment of the Rosetta Stone; the Greek ruler Ptolemy V was mentioned in the Greek text on the stone, and Champollion was able to use this correlation to decipher the names of Egyptian rulers Ramesses and Thutmose, and thereby determine the phonetic and logographic natures of hieroglyphic script. There are a number of other signs, often grammatical in nature: Filling strokes, as their name implies, serve to fill up empty space at the end of a quadrant of text. To indicate two of a word, the sign is doubled; to indicate a plural, the sign is tripled. Some signs are also formed from a combination of several other signs, creating a new meaning. It is nearly impossible to know the true pronunciation of many ancient Egyptian words, particularly since there are no vowels in hieroglyphic script. Modern pronunciation of ancient Egyptian has numerous problems. Because of the lack of vowels, Egyptologists developed conventions of inserting vowel sounds in order to make words pronounceable in discussion and lectures. The triconsonontal glyph “nfr” thereby became known as “nefer,” and so forth. Another problem is that the lack of standardized spelling—one or more variants existed for numerous words. Many apparent spelling errors may be more an issue of chronology than actual errors; spelling and standards varied over time, as they did in many other languages (including English). However, older spellings of words were often used alongside newer practices, confusing the issue. Cataloging systems such as Gardiner's Sign List, a list of common Egyptian hieroglyphs compiled by Sir Alan Gardiner and considered a standard reference, are now available to understand the context of texts, thus clarifying the presence of determinatives, ideograms, and other ambiguous signs in transliteration. There is also a standard system for the computer-encoding of transliterations of Egyptian hieroglyphic texts, known as the "Manuel de Codage." Clues about the pronunciation of the late stages of the Egyptian language can found as Egyptians began to write exclusively with the Greek alphabet. Seven letters were borrowed from the demotic alphabet to represent sounds that did not exist in Greek. Because the Greek alphabet includes vowels, scholars have a good idea what the last stage of Egyptian language (Coptic) sounded like, and can make inferences about earlier pronunciations. Although Coptic has not been a spoken language since the seventeenth century, it has remained the language of the Coptic Church, and learning this language aided Champollion in his decipherment of the Rosetta Stone. 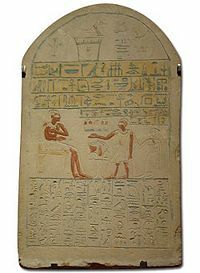 Border Stela of Senusret III. Middle Kingdom of Egypt, 12th dynasty, c. 1860 B.C.E. Limestone balustrade decorated with royal cartouches from Amarna (Dynasty 18). An amphora-type pot with 3 columns of hieroglyphs. Pyramid text in Teti pyramid in Saqqara, Egypt. Statue of Memi, left side; Giza, 5th dynasty. Kneeling statue, presenting a memorial stele. Scarab with the cartouche of Rameses II: Pharaoh firing bow. Red granite sarcophagus of Ramses III. Goddess Nephthys seated on the Egyptian language hieroglyph for gold. Sphinx-lion of Thutmose III, laying on the Nine Bows (the foreign peoples in subjugation), and the Thutmosis cartouche on the sphinx's breast. Sarcophagus originally intended for Hatshepsut, reinscribed for her father, Thutmose I. Made of painted quartzite, from the Valley of the Kings, Thebes. 18th dynasty, reign of Hatshepsut, circa 1473-1458 B.C.E. Quartzite block statue of Senenmut, from the time of the 18th dynasty, circa 1480 B.C.E. Originally from Thebes, at the Temple of Karnak. Inscriptions on the body emphasize his relationship with Thutmose III, while those on the base talk about Hatshepsut. Egyptian hieroglyph text on a royal sarcophagus from the Valley of the Kings (KV.57), the tomb of Horemheb the last Pharaoh of the 18th Dynasty from 1319 B.C.E. to late 1292 B.C.E. ↑ Francesca Jourdan, "The Narmer Palette," InScription, Journal of Ancient Egypt (7), 2000. Retrieved February 23, 2009. ↑ Lawrence Lo, “Egyptian,” AncientScripts.com, 2007. Retrieved February 23, 2009. ↑ Jennifer Hill, “Ancient Egypt Online.” Retrieved February 23, 2009. ↑ Okasha El Daly, Egyptology: The Missing Millennium (London: University College London Press, 2005, ISBN 1844720632). ↑ Science Daily, “Hieroglyphics Cracked 1,000 Years Earlier Than Thought,” October 7, 2004. Retrieved February 23, 2009. ↑ BBC, “Hieroglyphs.” Retrieved February 23, 2009. ↑ British Museum, “The Rosetta Stone,” The British Museum. Retrieved February 23, 2009. ↑ Alan H. Gardiner, Egyptian Grammar (The Griffith Institute, 1973, ISBN 0900416351). ↑ History World, “Ancient Egypt, Hieroglyphics.” Retrieved February 23, 2009. ↑ Kelley L. Ross, “The Pronunciation of Ancient Egyptian,” The Proceedings of the Friesian School, Fourth Series, 2007. Retrieved February 23, 2009. Adkins, Lesley, and Roy Adkins. The Keys of Egypt: The Obsession to Decipher Egyptian Hieroglyphs. HarperCollins Publishers, 2000. ISBN 0060194391. Allen, James P. Middle Egyptian: An Introduction to the Language and Culture of Hieroglyphs. Cambridge University Press, 1999. ISBN 0521774837. Collier, Mark, and Bill Manley. How to Read Egyptian Hieroglyphs: A Step-by-step Guide to Teach Yourself. British Museum Press, 1998. ISBN 0714119105. El Daly, Okasha. Egyptology: The Missing Millennium. London: University College London Press, 2005. ISBN 1844720632. Faulkner, Raymond O. Concise Dictionary of Middle Egyptian. The Griffith Institute, 1962. ISBN 0900416327. Gardiner, Alan H. Egyptian Grammar: Being an Introduction to the Study of Hieroglyphs. The Griffith Institute, 1973. ISBN 0900416351. Kamrin, Janice. Ancient Egyptian Hieroglyphs; A Practical Guide. Harry N. Abrams, Inc., 2004. ISBN 081094961X. McDonald, Angela. Write Your Own Egyptian Hieroglyphs. Berkeley, CA: University of California Press, 2007. ISBN 0520252357. This page was last modified on 19 September 2017, at 16:35.